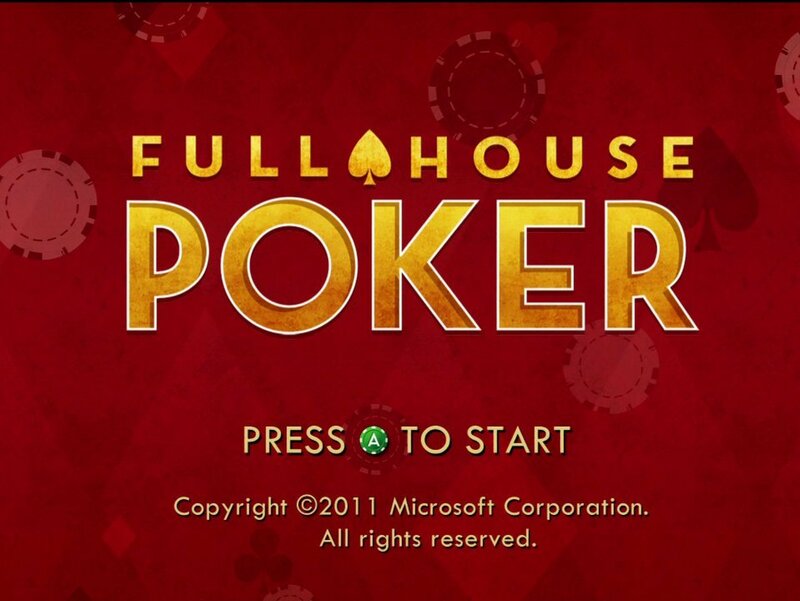 The final entry in the House Party for XBLA is a game called Full House Poker. Like Solitaire or Snake, Poker is one of those games that everyone knows how to play, and thus we all know what to expect. This simultaneously makes it a natural choice when entering a new platform and a difficult title to make stand out. 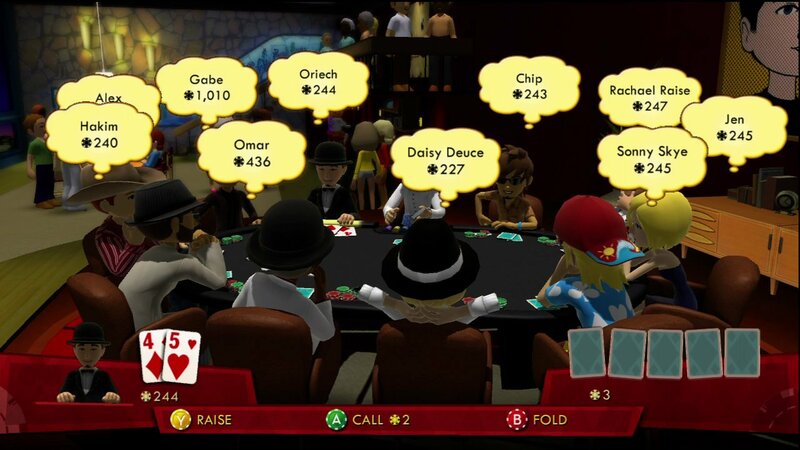 Let’s take a look at what this poker game has to offer. 90% of gameplay looks like this. As is the case with most of the aspects of a poker game, there really isn’t much opportunity, or even need, to make it visually stunning. Thus, rather than needlessly crafting photorealistic character models and 100% faithful “chip physics” the makers of this game decided to take advantage of your Avatar. It is an obvious and effective choice, by allowing the online identity that the player has already crafted to serve as the in game persona. 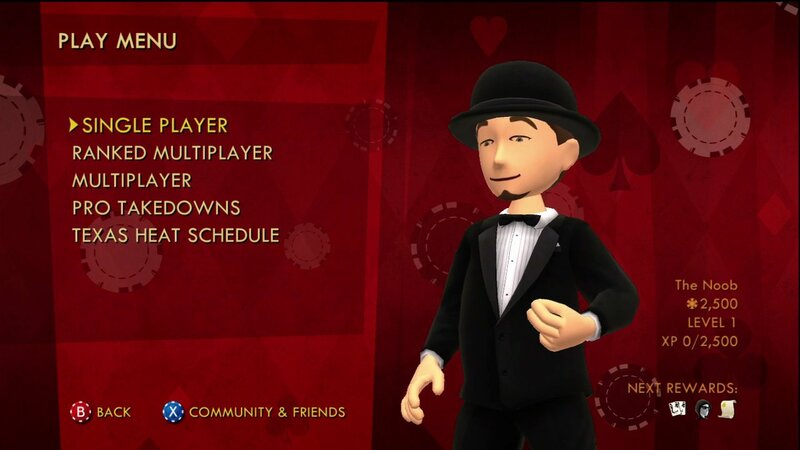 Behold, the dapper avatar of our reviewer. 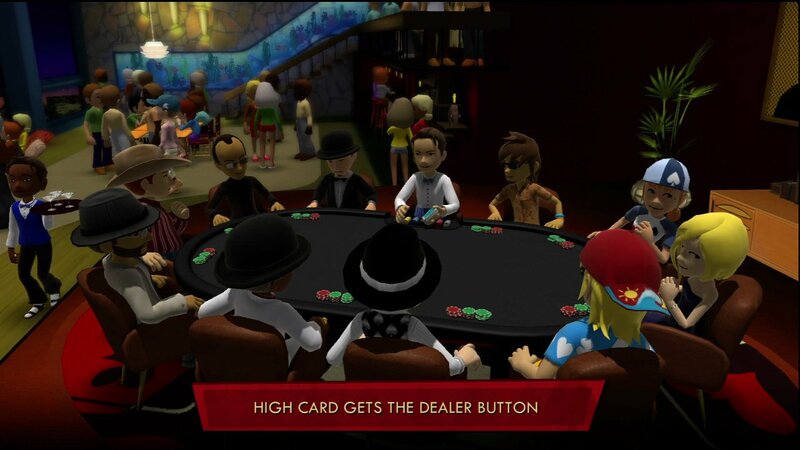 To go along with the already customized player character, Full House Poker allows you to customize most aspects of your virtual casino. 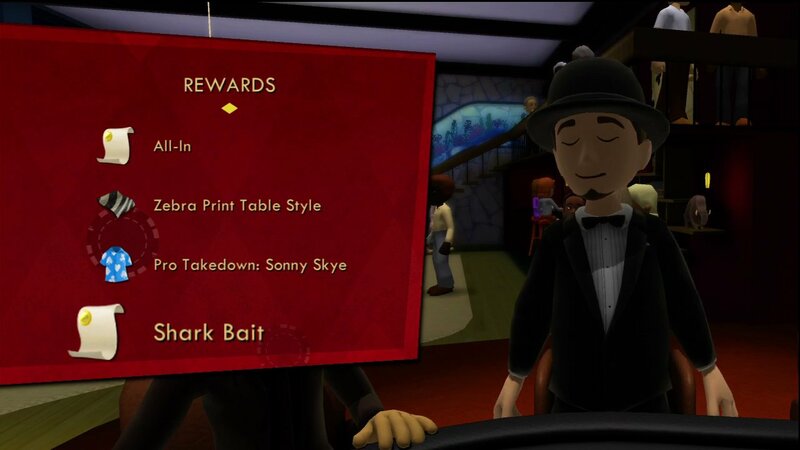 Via unlockable rewards that we will discuss later, you can select your own deck of cards, table, chairs, costume, and one of three casino settings. 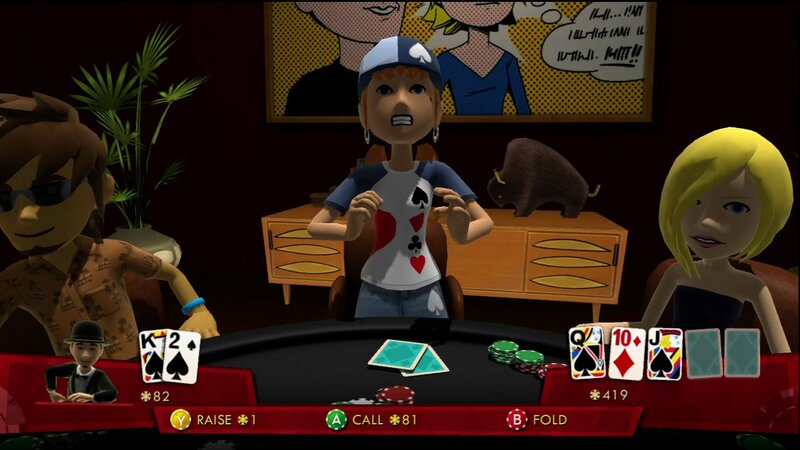 You can even, through marketplace purchases and unlocks, recreate the iconic “Dogs Playing Poker” painting. Finally! Don’t get me wrong, the game isn’t all wacky chip tricks and silly costumes, there are a few subtle things about the visuals that are worth mentioning. 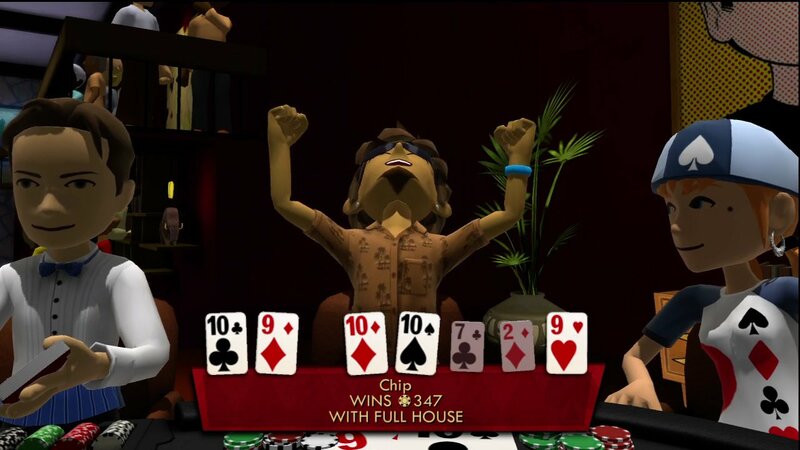 Animations can be selected to indicate your confidence level when performing an act, and when you are checking out chip totals and such about other players, your character actually turns in their direction, tipping them off that they’ve got your attention. There isn’t much that needs to be said about the gameplay. 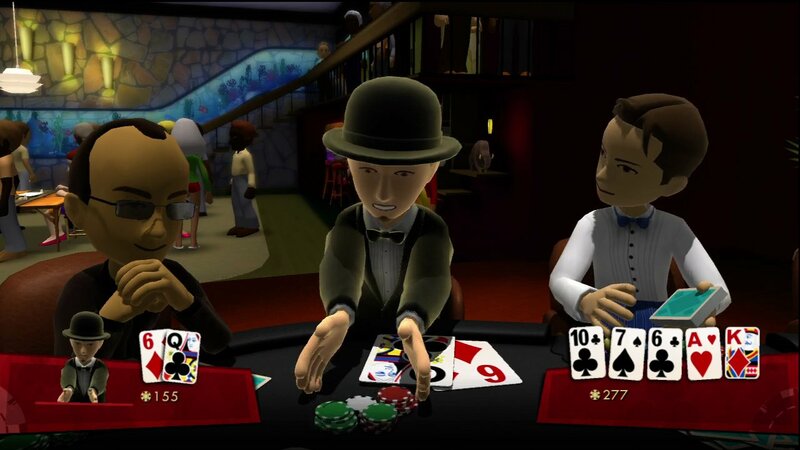 It is simply Texas Hold ‘em, streamlined for a controller and played by avatars. There are numerous different spins on the game, including high, low, and high-low split. 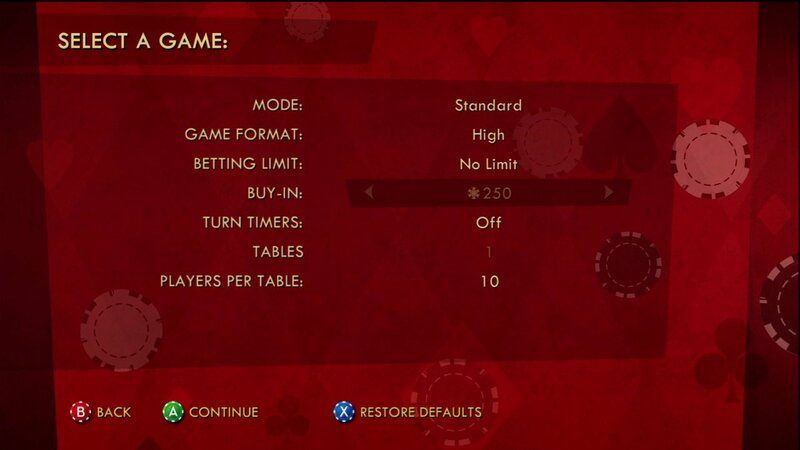 You’ve also got pot limit, spread limit, limit, and no limit betting to choose from. That’s great if you are a poker fan who craves variety or has a favorite style rule set, and is helpful if you are new to poker and want to get your feet wet without incurring any major consequences. Note the distinct lack of home foreclosure as a consequence. Knowing when to hold ‘em and when to fold ‘em is only one small part of poker, though. One of the things that continues to give real world players the edge over people who have only played online is the fact that in real life you have body language to read in order to get an idea of a player’s mood, and likewise the ability to lie with that body language in order to throw others off of your scent. 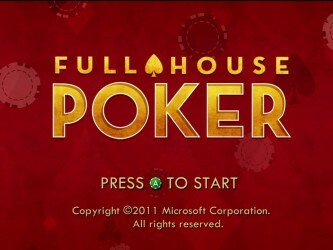 Full House Poker adds a bit of that into the mix. By holding either of the triggers during an interaction, you can put a meek or over-the-top spin on it. Have a garbage hand but want to try to bluff? Hold the appropriate trigger while raising and your character will slam the chips down triumphantly. Have a super hand and want to milk as many chips as possible out of the table? Hold the other trigger and your avatar will appear to have second thoughts about pushing forward the raise. It isn’t subtle or nuanced, but it is another layer of gameplay, giving you one more tool to manipulate your opponents. 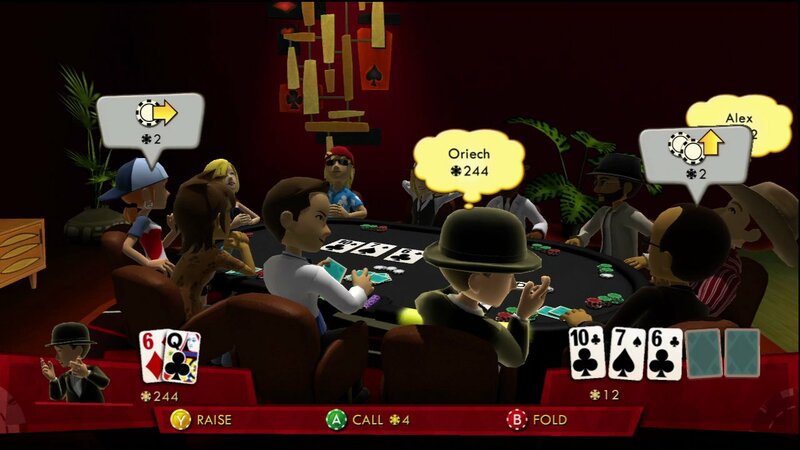 Now, poker is an implicitly multiplayer game, and it is clear that XBLA multiplayer was the primary reason for the game’s creation. There is a single player campaign in which you endeavor to defeat 10 different AI controlled players who make use of real world strategies, but the meat and potatoes of the game comes from the online experience. You can put together tournaments of up to three ten-person tables, and a neat feature called “Texas Heat” is essentially a regularly scheduled massive online tournament. Pretty cool. Every hand earns you experience which, aside from giving your opponents an idea of how tough of a player you are likely to be, unlocks awards. Though this serves as a motivator to keep playing, and gives you little benefits for sticking with it, most of them have little impact on the game itself. Leveling up DOES give you access to the high level Pros to beat in single player, though. 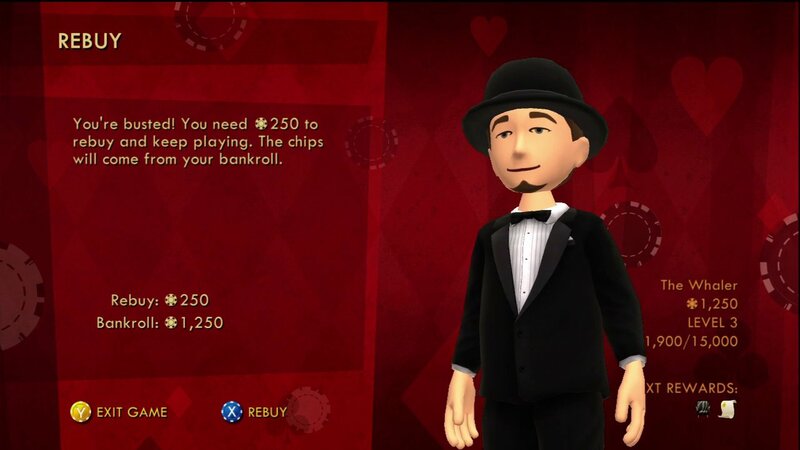 You have a bankroll with a fairly sizable starting balance, and can use it to buy back into games that you’ve busted out of and can be replenished by a trip the ATM. This bankroll, like your experience, persists between games, and between PLATFORMS as well, which is actually pretty awesome. You see, this game has a Windows Phone 7 variant, and the XP and cash you accumulate follows you back and forth, which is an excellent idea, and one I would like to see more of. There isn’t much to be said about the sound in this game. It is essentially the sound in the casino: quiet, unassuming elevator music mingled with indistinct crowd chatter. It certainly sets the mood, but don’t expect to get any rockin’ tunes stuck in your head. 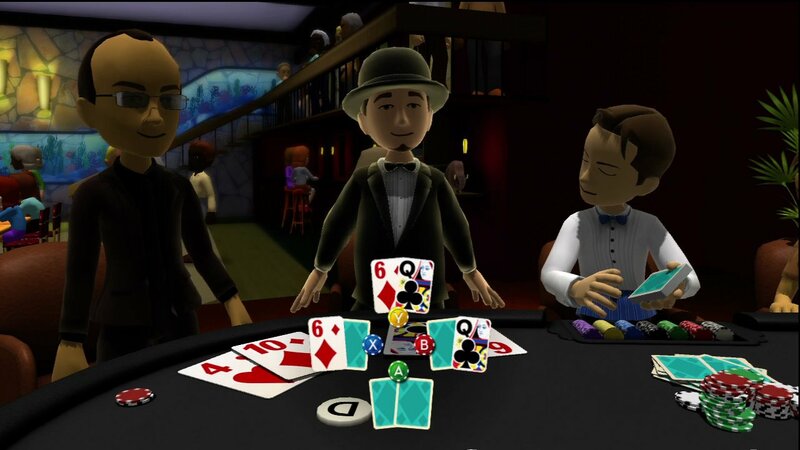 Your Avatar is a former professional card player who has given up the tables to focus on his law degree until is friend is released from jail and enlists his help in earning enough money to pay off an outstanding debt to John Malkovich. Actually, I might be getting this mixed up with Rounders. Never mind, no story to speak of. Considering the simple and ubiquitous nature of the subject matter, there were very few opportunities for this game to be exceptional. 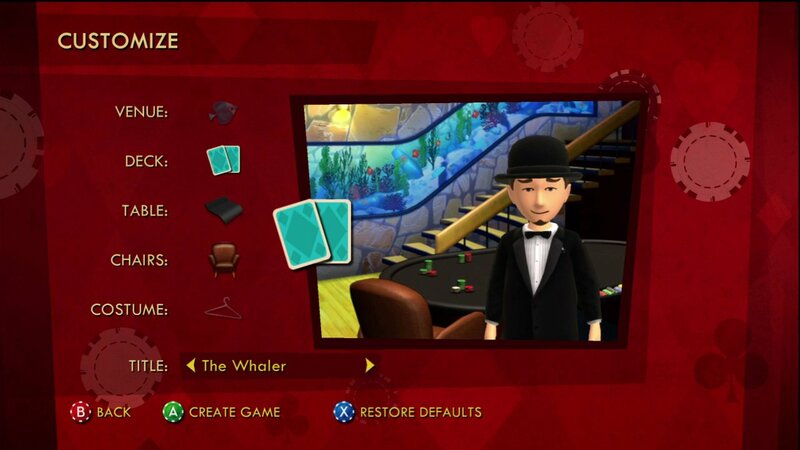 That said, it does what it sets out to do, and it does it well, providing an excellent poker experience. 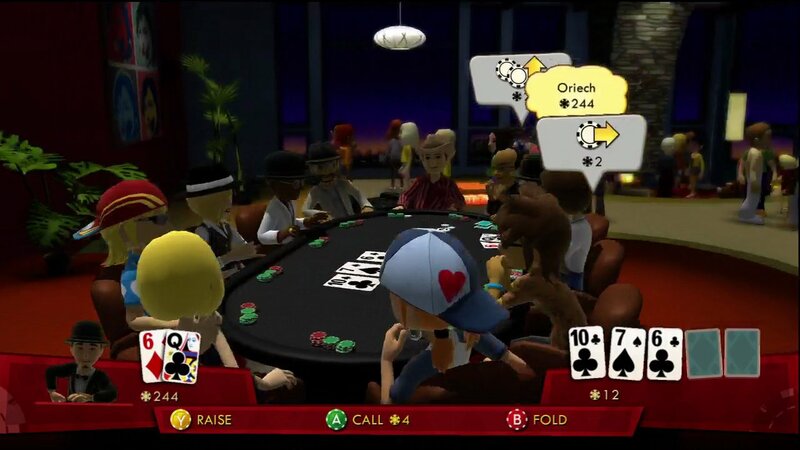 If you are a poker fan, and your XBLA friends list is filled with the same, then this may well be the way you’ll be spending your nights for the foreseeable future. 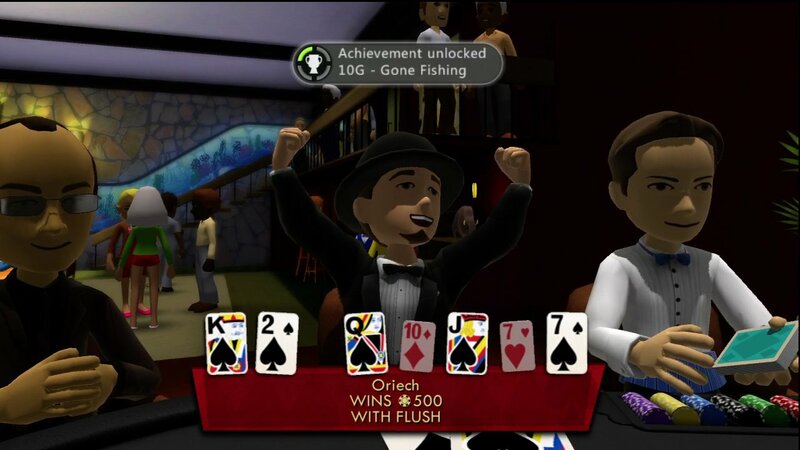 8.0 / 10: A well executed poker game, equally at home on the console and on the phone. You article makes me curious for card games. I honestly say that i have never seen multi player option before. So that it could be fun to get this application which you have shown above.